In high school freshman biology, my son’s class covered Charles Darwin’s theory of biological evolution. Following Darwin, eons of observation shows that organisms arise and develop through the natural selection of small, inherited variations that increase a species’ ability to compete, survive, and reproduce. Much like Darwin, honing brand identity in our dynamic, changing industry, is often called into question. Among my V2V colleagues we have an ongoing conversation of what comprises the unique brand identity of a health care organization. Today, it’s so much more consumer-focused and patient-driven than ever before. Can you express your brand, on-time and within budget? Yes, it IS possible to accomplish this goal. What comprises your organization’s brand is definitely evolving in health care. Much like natural selection, certain patterns have developed, requiring you to be much more intentional than ever before. Yet, there are specific steps to take that ensure your brand survives and thrives in this new business of health care. 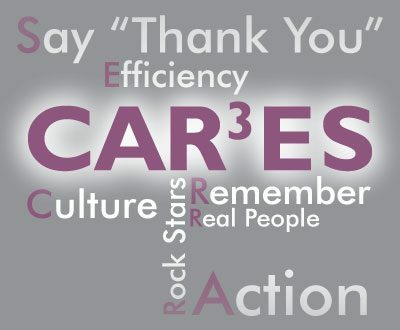 I have found that an organization that CAR3ES about its people, employing five key elements, creates a distinct, successful, and enduring brand. Culture: First and foremost, a positive, distinct, brand requires a culture that commits to excellence. My colleague, Debra Wiggs, says that culture eats mission for breakfast. Oh, ain’t that the truth. One hospital I supported, literally, painted their mission statement on the walls. Yet, they still languished at the bottom of the heap in terms of quality outcomes and patient satisfaction.Once they committed to a rigorous program of quality measures providing their patients with compassionate+skillful care, a very real shift took place. The entire health system kept score. From housekeepers to PT aides, to RTs/OTs, and the nursing and physician cadre, whether in- or out-patient, everyone asked themselves, “How can I help keep the promise of effective, compassionate care that makes a positive difference in our patients’ lives?” Their mission finally became their culture. Action: Effective brand strategy takes action. Deb also says “Take small steps, frequently,” and that is especially true in brand positioning. Earlier, I wrote about my stand-walk-run philosophy, and this reflects the power of asking your team: What can we do now-soon-and later to build success at branding our organization, building patient volumes, and reaching our business goals?First and foremost, what are your business goals? Do you know where you want to be at the end of the year? What are your priorities and what are your greatest revenue-generating service lines? What’s the budget to operate and then maintain or grow your business this year? Develop your vision and plan for the way forward. Garner buy-in at all levels of the organization. Create a calendar that puts in place milestone achievements. And, make sure you add in some bright, shiny things to demonstrate quick success, trust, and relationships. Yes, you will have employees featured in your advertising or marketing pieces that leave your organization. Yes, your patients will move away, or even pass away. You will also find some people who, due to personal or professional issues, can no longer be featured in your public, promotional imagery. However, if you commit to a refresh of your imagery on a regular basis, that is okay. It is factored into your ongoing commitment to tell your brand story by featuring the real-life heroes and champions of your organization. Efficiency: Make efficient use of all your communication platforms. Nowadays, we have SO many ways to reach out, directly and indirectly, to our key stakeholders. There’s snail mail, email, Facebook, Twitter, YouTube, Instagram, Pinterest, and billboards, print magazines, newspapers, and their e-platform counterparts. It can be a crazy, mixed up, mad, mad, Worldwide Web world!It’s important, no, it’s critical to understand which stories and messages will resonate with each audience who use each specific platform. Once you have a grasp on that issue, then make a coordinated, date-driven, nimble plan that makes use of all the resources at your disposal in a cost+efficient manner. No, it’s not rocket science. And, yes, it can be pulled off on a realistic budget. Say Thank You: As simple as that. Tell the people who allowed their stories to be told that you appreciate how they helped your organization. At one health system, we took two years’ worth of marketing and advertising images and stories, framed them and invited those people in to break bread with us. Over an hour and a half, we presented those framed pieces like they were the Academy Awards and expressed our sincere gratitude for their support of our efforts.We stood and applauded their survival of illness or injury, their contribution to ensuring safe and compassionate health+care, and for their support of our lifesaving role in the community. There wasn’t a dry eye in the place. It was an impressive, sentinel moment for this health system and it will be for yours, too. Just like the organisms that Darwin identified, there are specific ways to evolve and adapt in order to survive and thrive in this new business of health care. It requires that yours to be a nimble organization that CAR3ES about its community: Including your patients, providers, employees, and your key area leaders. Are you ready? We can help your organization gain a Distinct Advantage℠ in your health care brand. Know of an event that should be on our calendar? Contact us! Read our latest thoughts on the Healthcare industry. Michelle Wier – President, Wier Management Solutions, Inc.
V2V Management Solutions • 635 Main Street, Lewiston, ID 83501 • 208.717.3940 Regional Offices: Bellingham, WA | Sacramento, CA © 2016–2019 · V2V Management Solutions · All Rights Reserved.